Ladies and Gentlemen, welcome to the RPG Codex 2018 GOTY Award! 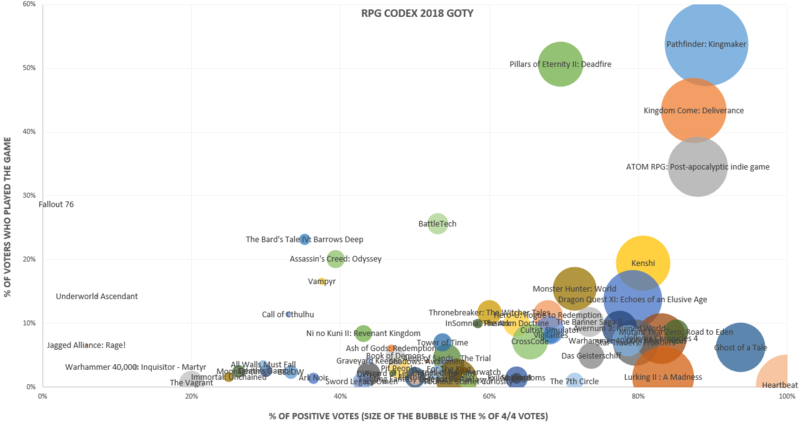 This year we had 773 voters, who rated a whopping 114 RPGs that came out in 2018, including DLCs, PC ports and remakes. Once again we had three categories: Game of the Year, Best Expansion/DLC and Best PC Port/Remaster. For the full results and fancy graphs, just follow the link bellow. Pathfinder: Kingmaker was not only voted the best of the two, but also the best and most popular RPG of the year! And with the highest % of 4/4 votes! In second place we have Kingdom Come: Deliverance, Daniel Vávra's cinematic peasant simulator. Quite an impressive result, especially since it was released in February 2018, which feels like 20 years ago. Its DLCs didn't get such a warm reception, but the core game clearly left a mark. Now, if the Codex loves Infinity Engine games, it loves Fallout even more. And when a small Russian team released ATOM RPG in December 19, it took the Codex by storm and won third place in our poll. Yes, it was in Early Access before, but still, it is the 4th most played game of the year! And so we have our top three, dominated entirely by Eastern European games. With Obsidian and inXile now under Microsoft's rule, Bethesda stained by Fallout 76, and BioWare abandoning the story-driven RPGs to make a pew-pew game, it will be interesting to see how things go in 2019. Moving on with the results, more people should definitely give Kenshi, Dragon Quest XI and Ghost of a Tale a try. They had excellent results but a low % of players. (Due to my mistake, Ghost of a Tale was not in the poll in the first few hours, but even compensating for that it has a small number of players). You might notice that 10% of Pillars of Eternity II's votes were 1/4, which is quite high. But it was not a down-vote campaign that brought it down to 6th place: even if you removed all of the 1/4 votes, PoE2 would still be below Kenshi and DQ11. ...because, by a huge margin, the best remake/port of 2018 is The Bard's Tale Trilogy! Krome Studios managed to strike a perfect balance between being faithful to the original and adding quality of life improvements, reinvigorating a game that's over 30 years old and making it one of our most played game in 2018! To give you an idea of its popularity, it would rank 4th in the GOTY poll! Krome Studios, if you're reading this please remake the Gold Box series next. Thank you. The results also show that more people might want to give Trails of Cold Steel II, Resonance of Fate and Labyrinth of Refrain a try, since the few people who played them absolutely loved them. Pathfinder: Kingmaker was the GOTY, and its DLC The Wildcards was very well received, but it was only 2nd in our poll. The winner was Beast & Exploration, an expansion to last year's Battle Brothers (voted 3rd in the 2017 GOTY poll). I confess this is a bit awkward, since I forgot to include it when the poll began, but it was quickly added and having more votes would've only increased its distance from the 2nd place.